Christmas is coming, didn't you know?! Every year I do a whip round of the local hotels (and some further afield) to see what they've got planned for Christmas and NYE so you can have a one stop spot to see whats what for this coming festive season. It should be noted that Mouloud (The Prophet's Birthday) is expected to be observed on Thursday 24th December, it is expected that Christmas Eve will be dry, and possibly Christmas Day too. 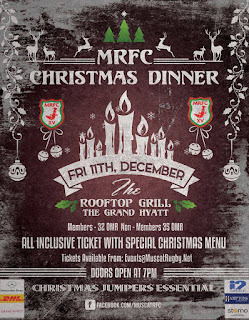 On December 11th at 7pm the Safari rooftop grill are hosting the MRFC Christmas dinner, anyone who went to the Halloween party recently will know the kind of crowd that attends the MRFC parties. The theme this time is once again rubbish Christmas jumpers - tickets are RO 32 for members or RO 35 for non-members. 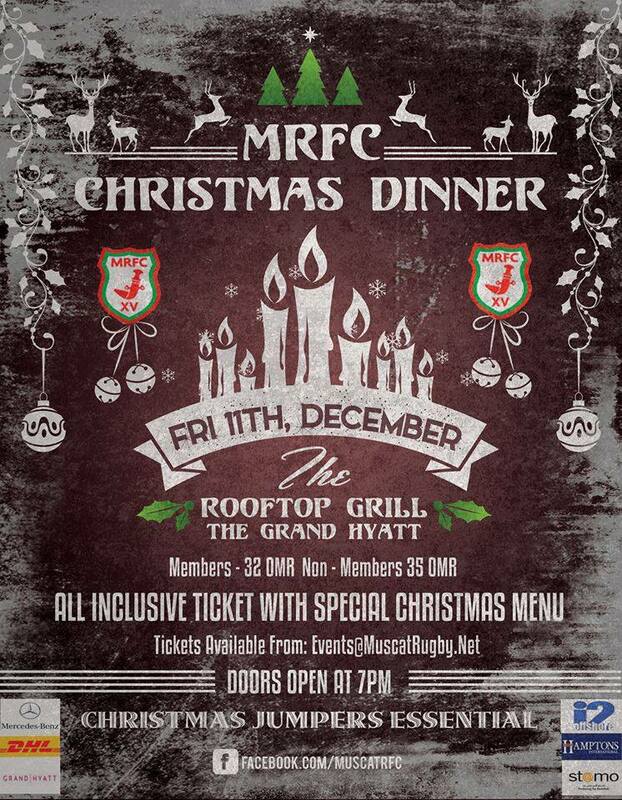 Includes all you can eat and drink and to get tickets email events@muscatrugby.net. Mokha Cafe - Christmas dinner buffet - RO 29 or RO 36 with a glass of sparkling wine, kids RO 16 (6-12 years old) from 7-11pm. Tuscany - Chef's traditional Christmas specials, a la carte pricing, from 7-11pm. Safari Pub - RO 5 cover charge from 7pm-3am, regular a la carte pricing. Safari Rooftop Grill - RO 33 for seafood or poultry, RO 39 for US beef, seafood platter or surf n turf or RO 45 for Canadian Beef, Angus Beef, Wagyu or Seafood. Inclusive of all drinks, from 7-11pm. Tuscany - Chef's traditional Christmas specials, a la carte pricing, from 12:30-3:30pm. Sirj Tea Lounge - Welcome drink for guests dining at Tuscany or the Garden (sparkling wine and juices) between 7-8pm, with live piano playing. Mokha Cafe - RO 99 open bar (but if you book before 15 December its RO 90) RO 40 for kids (6-12 years old). "The Grand Throwback" with European DJ & International artists performing with acts throughout the evening. An a la carte champagne bar will also be available. Safari Pub - RO 15 door charge which gets you one free welcome drink. Safari Rooftop Grill - RO 65 (kids RO 30) for a special gourmet set menu including open bar with live DJ. Camp Hyatt - Running from 8pm-2am this is a complimentary kids play area with fun activities for the kids while you enjoy your night. Musandam Cafe - RO 26++ for adults, (kids RO 13++, under 6 are free) for Christmas buffet, drinks packages are available too, from 7pm. Al Ghazal Pub - RO 5 entry including a complimentary drink. Trader Vics - RO 28++ for a set 4 course dinner with live music, or the a la carte menu is available too, from 7pm. Tomato - RO 19++ for a 3 course Mediterranean festive dinner, or the a la carte menu, from 7pm. Musandam Cafe - RO 30++ for adults, (kids RO 15++, under 6 are free) for Christmas buffet, drinks packages are available too, from 12:30-4pm. Santa will be visiting for the kids. Trader Vic's - RO 75++ for a Polynesian inspired 5 course set menu including drinks, from 7pm. Kids a la carte menu also available. Tiki Bar - Champagne & Oysters a la carte from 9pm-2am. Al Ghazal Pub - RO 10 entry from 7pm, resident DJ providing the entertainment. Musandam Cafe - RO 20++ for adults (RO 30++ for bubbly), (kids RO 10++, under 6 are free) for a relaxing brunch to recover from the night before - bring your ticket to either the White party or the Trader Vics party the night before for a 20% discount. China Mood - RO 45++ 5 course set menu with live show by the Tea Sommelier. Beach Pavilion - RO 45++ 5 course set menu with "live vocal performance" dine under the stars on the beach. Al Khiran Terrace - RO 25++ (RO 39++ with booze, kids for RO 12++) for a Christmas themed buffet dinner. Al Bustan beachfront and gardens - RO 109++ for a Masquerade Gala dinner from 8pm for a night of magic and mystique, kids under 6 free, cap the night off by lighting your own lantern and send it flying up into the sky, 8pm onwards. The Beach Pavilion - RO 65++ for a five course seafood themed dinner 7-11pm. Al Khiran Terrace - RO 28++ (RO 42++ with booze, RO 52++ with Champagne, RO 16++ for kids) for a relaxing New Years day brunch, 12:30-4pm. Sultanah - RO 50++ for a 6 course menu with live entertainment from resident jazz band. Shahrazad - RO 50++ for a Morrocan themed 6 course dinner with live Morroccan entertainment. Capri Court - RO 35++ for a traditional Italaian 5 course Christmas dinner. Bait al Bahr - RO 35++ for a seafood themed 5 course dinner. Samba - RO 22++ (or RO 32++ for house drinks) for a Christmas buffet dinner with focus on kids. Sultanah - RO 59++ for a bbq buffet with unlimited champagne and live entertainment from resident jazz band. Shahrazad - RO 35++ for a Morrocan themed 5 course dinner with live Morroccan entertainment. Capri Court - RO 25++ for a traditional Italaian 4 course Christmas dinner. Bait al Bahr - RO 25++ for a seafood themed 4 course dinner and then cocktails at the BAB lounge. Samba - RO 18++ (or RO 28++ for house drinks) for a Christmas buffet dinner with focus on kids. 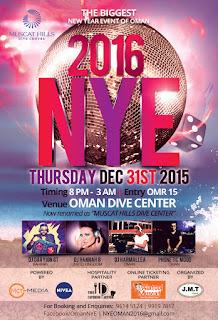 Turtle Beach - The concept is that if you have dinner at one of the hotels outlets, you can come to this party on the beach to celebrate the new year, then head to one of the afterparties (BAB lounge, the Long Bar or the Piano Lounge - RO 15 entry fee). 10pm-1am, then afterparty places run till 2am. There are NYE dinner options available at most of the hotel's F&B outlets, but they are all for in-house guests only. I'm told that there will be a very limited number of tickets available for non-hotel guests to the Gala NYE dinner and these can be purchased by calling 2477 6565, pricing is RO 119.50 net (kids RO 59.780). Olivios Terrace - RO 25 (RO 35 with booze, kids RO 12.5) for Traditional buffet dinner - 7-11pm. 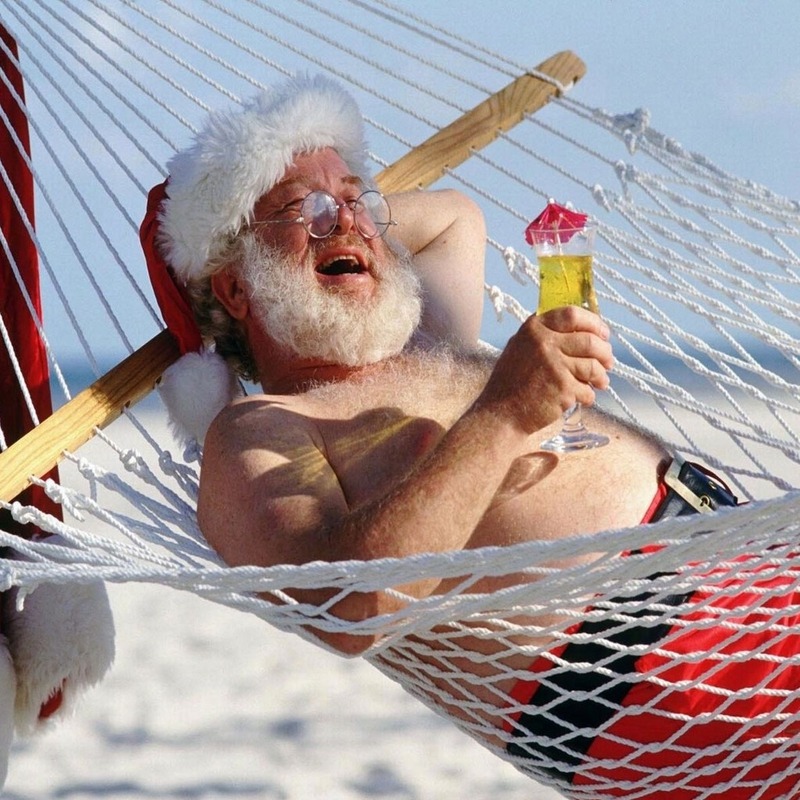 Olivios Terrace - RO 25 (RO 35 with booze, kids RO 12.5) for Traditional buffet lunch with visit from Santa - 1-5pm. Lazy Lizard Garden - RO 60 including free bar, DJ all night and buffet dinner, 7pm-1am. Olivios Terrace - RO 35 with booze, kids RO 17.5 for bubbly brunch - 1-5pm. The Park Inn haven't shared their plans for NYE, and as for Christmas, they're offering a buffet dinner daily for RO 16++ per person every day in December (except the 31st). One small twist - minimum of 20 people must be in the booking. RO 25 for Traditional buffet dinner (drinks extra at RO 10 pet person). Kids are RO 12.5. 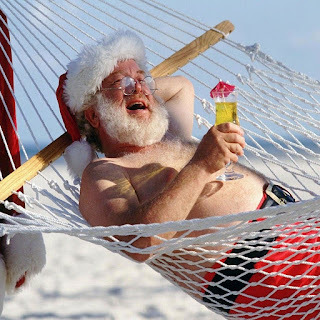 RO 25 (or RO 35 including selected drinks, Kids RO 12.5) for a Santa Clause Christmas brunch (and Santa visit) 1pm - 5pm. RO 45 including drinks for a Glamour gala dinner at the Lazy Lizard garden. RO 10 entry to O'Malleys Irish pub with complimentary drink. RO 35 with booze for a bubbly brunch (kids RO 17.5). RO 25 with glass of mulled wine or bubbly, or RO 30 with unlimited bubbly. 4 course turkey dinner for either lunch (at noon) or dinner (at 7pm). Kids half price (RO 12.5). Luxurious 6 course meal at Qureshi with after party in The Vault afterwards. RO 50 with free flowing bar (I think). RO 30 for Traditional buffet dinner (alcoholic drinks extra but complimentary glass of bubbles) including soft drinks. RO 134 for 2 including a room & breakfast and choice of either Christmas Eve or Day meal in Mydan. Pool side - RO 20 (RO 10 for kids 6-12) for Christmas roast mini brunch with one glass of wine complimentary (Soft drinks too). Gala at the Event plaza - RO 40 (RO 50 with booze or RO 170 with booze, a room with 5 comp drinks, breakfast and tickets for 2, RO 150 if you don't want booze) for a Glamour gala dinner (kids RO 20 6-12). 8pm-1am. RO 12.9++ for 3 course meal, two house beverages and live band and DJ. RO 25 per couple (single ladies free) for unlimited drinks until midnight & midnight toast - this is the best deal for NYE in town so far! Christmas at The Marina - Wednesday 16th December from 7:30pm - Marina Bandar al Rowdha - RO 26 paired with wines - call 2481 6363 for details and bookings. Group Christmas Lunch - minimum table of 8, RO 6 per person, full Christmas lunch, every Wednesday and Thursday 12-3pm in December at NHI in Ruwi, call 2481 6363 for details. 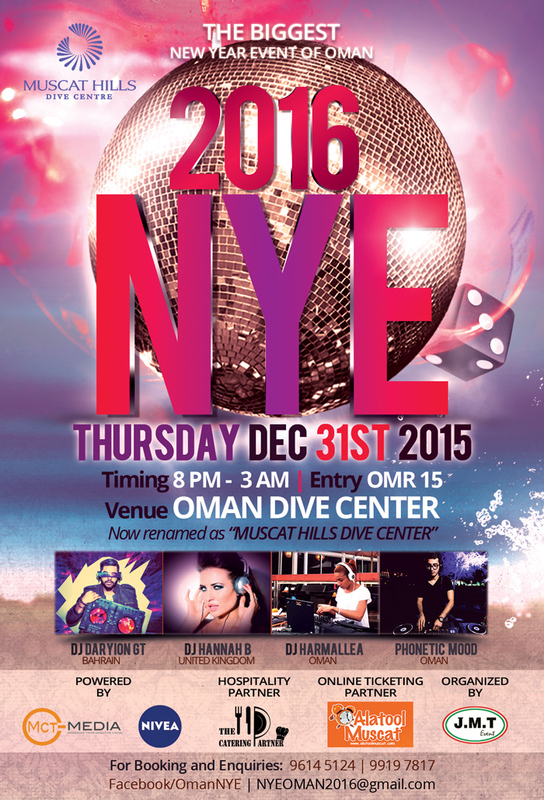 The Countdown 2016 - NYE - RO 30 single / RO 50 couple - 2 complimentary drinks, complimentary finger food. DJ's all night from 7pm-3am. Call 9709 8681 or 9241 7948 for tickets. Starting from 8pm until 3am. RO 15 per person, 4 DJ's, Daryion GT (Bahrain) Hannah B (UK) Harmallea (Oman and Phonetic Mood (Oman) providing the soundtrack to the evening. For tickets and inquiries you can call on 9614 5124 or 9919 7817 or check their facebook page. Food and drinks for purchase at usual ODC rates, or you can book a VIP table for 10 people at RO 650 and get 2 bottles of wine, a bottle of vodka, 10 beers, Arabic grills, salads and mixers for 10 and a special table set on the beach. RO 15 - 2 drinks, RO 40 - 2 drinks & dinner, RO 65 - unlimited drinks and dinner. Runs from 7pm and has DJ Chris Fisher & DJ Dovie providing the aural entertainment. Call 800 73529 or 9458 2970 for details. There are going to be more events at venues around town, but I've not learned the details yet. If you'd like your event included, then just email me! Any word on the takeaway menus for the hotels for Christmas?